Kumar’s entry level compact 2 BHK’s rank amongst the highest selling SKU’s for the company (in the entry level/ investment segment). Kumar Properties launched Pebble Park almost 5 years back; a 1000 + units mini-township. Let's deep dive into the product to see how have they fared! On evaluating the external amenities you will note it's loaded you have loads of open space, a clubhouse with gym cricket pitch with nets, sandpits, party lawns, table tennis, pool table, library, tennis court, basketball court, amphitheatre. They have it all. Hadapsar, a thriving suburb in East Pune is largely driven by economic activity in two major IT hubs in the vicinity - the SEZs at Magarpatta City and Fursungi IT Park (SP Infocity). Today it boasts big real estate projects such as Magarpatta City and Amanora in its vicinity. In addition to IT and ITeS, Hadapsar real estate market is also influenced by the small and large-scale factories close to it on the Pune-Solapur Road. The project is on the wrong side of the suburbs hence you can see lower rates however with upcoming infrastructure development things should improve the outlook of this area in a few years. Kumar Properties has a huge influence in development of this area, most of their projects are located in this belt of Hapadsar, Handewadi, Undri. Hence it's important the developer doesn’t go back on his promises since it will affect his reputation at large. This area commands high rentals since there are many colleges and corporate offices in the vicinity. From an entertainment perspective you have Amanora Town Center which is 6 km’s away, Town Square shopping centre which is 2.6 km’s away. Overall it’s a location in its development stage. Four apartments per floor with 2 facings/ views - garden and road facing. Without any doubt, the most premium apartments are the lower floor garden facing apartments. The master plan is a typical box/ square shaped layout wherein you get all the amenities in the centre. A little more spacing in the buildings would have really helped ensure more ventilation and openness. 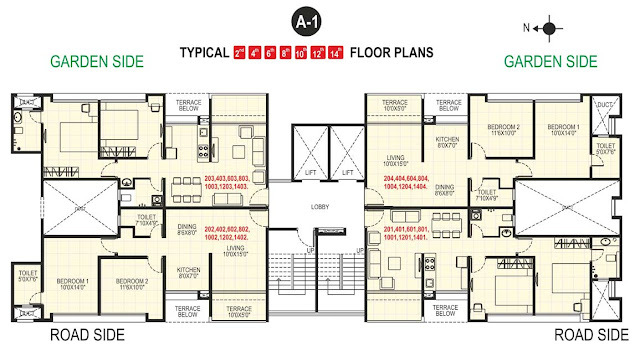 Coming to the floor plans, these are typical compact 2 BHK’s. Typical projects made for investors. Projects with all the features yet small in size. More like your Hyundai Eon’s & Hyundai i10’s. The apartments come in 2 variants with builtup areas of 910 sqft and 923 sqft Where in the carpet is roughly measures up to 670sqft including terrace of 40 sqft. 4 apartments per floor are good. The lobby is averagely sized. Coming to the floor plan, the master bedroom is fairly sized (approx 140 sqft.). But that’s where the space quotient ends. All other rooms including the guest bedroom of size 110 sqft, the living and dining area and the kitchen are a little congested for our liking. If you are going keen on going for this project you should consider garden facing apartments. Talking points in the product as far as internal amenities are concerned are pretty hygiene and basic in nature. Few highlights would be concealed electricals, elegant entrance lobby with tiles/marble flooring in the main entrance lobby of every building all internal laminated doors, vitrified tile flooring in all rooms & anti-skid flooring for terraces. The kitchen comes with a black granite top with steel sunk, high-quality chrome-plated brass taps & concealed plumbing with premium quality pipes. Pretty routine and functional in nature. 1. Master plan layout gives you a feeling of living in a block. 1. They charge terribly high maintenance but don’t give proper service. Kumar has charged from each flat owner around 3000 rs months maintenance charges. They don’t provide proper drinking corporation water, Security is sleeping all the time, Intercom which they say is free is chargeable every month from Tata services. 2. they have two tanks on the top of each wing. One tank is for flush and toilet water use which is sewage treatment water and another is used for shower and KITCHEN. They have the same pipeline for showers and kitchen can you believe it and they give boring water in this - Hard water containing calcium very high, because of which bathroom floors are all white, vessels in kitchen when washed with this water have calcium layer white particles - This water when used for drinking even if you use water purifier causes kidney stones in our body. Kumar properties will never give corporation water in the kitchen because the water line is same for kitchen and shower. The water is not treated and softened - you need expensive RO treatment for reducing the calcium substance from the water for using it to drink. Kumar is disgusting, they are looting people in the name of township. When asked to Mr Vinod Ghormore about the various problem we are facing he is so useless that his answer is always to go and talk to Kumar office in Camp. He is a useless manager which is just sitting and doing nothing. BEWARE - Don’t invest in Kumar pebble park else you will be crazy solving every day a new problem. Their internal quality of houses and flats is not unto mark. As its a township they treat it like slum area and the quality is also the same. Workers or Kumar people hide and rob things which are kept outside door. It's a regret for me to write such a review as I thought Kumar was a good brand but no. KUMAR PEBBLE PARK is not at all one. you can judge them as - when they are providing boring water or mixed boring and corporation water for kitchen and drinking use - judge the quality yourself. Best of luck and see yourself when you visit the place.